Basketball Spotlight took a trip to Columbus, Ohio for the Buckeye Prep Elite Showcase. Here’s a look the Part 1 of the top performers from the Class of 2021. Seth Wilson Guard (Ohio)- Wilson has a national rep and can score the rock with the best of them. He gets it done from all three levels but gets more bang for his buck in traffic. He likes to uses floaters, runners and kisses off the glass. His scoring and production helped him when MVP of both games I watched him play. My only concern is that he might have to make the transition to point guard which could be a task because he so wired to score. EJ Farmer Guard (Ohio)- The slippery lefty slides through defenders and strides to the bucket for points. He has long range and confidence in his shot while being able to put buckets together at a rapid pace. On defense he’s able to disrupt the passing lanes with his speed and length. He had an argument for to MVP in the Ohio North Vs South Game. Jack Sawyer Forward (Ohio)- Sawyer versatility showed in the showcase games. He proved to be too quick for post players and having enough skill to get things done on the perimeter. He was a tireless worker with a nose for the ball and a high motor. He did enough to take home MVP honors for his squad. 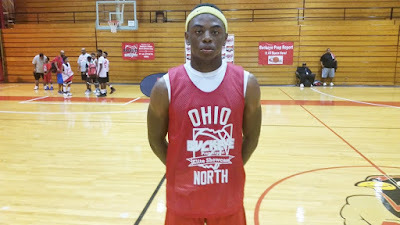 Meechie Johnson Guard (Ohio)- Johnson shot the rock better in his second outing. He was able to get some clean looks while breaking down defenders. I think he looked his best when he was play making for others. He has the natural ability to get to the rim whenever we wants. I also believe his shot selection will improve as he matures in the game. Malachi Branham Guard (Ohio)- Malachi arrived late for his first game and went right into the action. He has the smoothness that you love to see on his shot and finishing. I would also like to mention he has natural wing size. His squad was down big before he arrived and quickly turned this around with his mere presence. I was impressed with this youngster. Jadem Hameed Guard (Ohio)- Hameed is a strong compact point guard that not only has a bully game but also has the natural feel for the position. He dribbled past defenders and also hit cutting teammates on the dime. He can get rid of on ball defenders with his slick handle. Trey James Forward (Kentucky)- James is a space eater in the middle. He lumbers around while hitting the glass and disrupting the middle on defense. He can alter shots and simply toss them back. On offense he was the most effective inside near the cup where he got put back buckets. He has great size for an 8th Grader. Deajuan Stepp Forward (Kentucky)- Stepp runs the floor like a wide receiver and finished well when he got the chance. As the game went on he became more comfortable and his play making ability began to flourish. He threw a few nice passes and also showed he could create his own shot after getting rid of defenders.